Chuhak & Tecson, P.C. and Mitsui Rail Capital LLC have teamed up to help law students at Chicago-Kent College of Law gain real world legal experience. Two Chicago-Kent students spent the last few months working as externs on a case with Rudy Figueroa, Vice President of Administration, Human Resources & Legal Department, and General Counsel and Corporate Secretary for MRC. Chuhak & Tecson principal Fred C. Begy III serves as counsel for MRC. The students, Simon Feng and Victor Ortiz, spent several months working on transactional and litigation matters. According to Ortiz, law schools rarely teach students transactional work at a practical level, making the MRC opportunity even more valuable. Feng and Ortiz, who will graduate in May 2012, are not the first Chicago-Kent students to extern with MRC. The program began in late 2009, with Figueroa selecting two students as externs each semester. “During the economic downturn, I realized how difficult the legal environment was for law students and recent graduates,” Figueroa said. “I felt compelled to assist law students in preparing for their future careers by providing an opportunity that would bolster their experience. As part of the extern program, Begy invited Feng and Ortiz to Chuhak & Tecson’s downtown Chicago office. He introduced them to everyday firm life by conducting a client practice orientation, as well as an orientation focused on Chuhak’s operations. 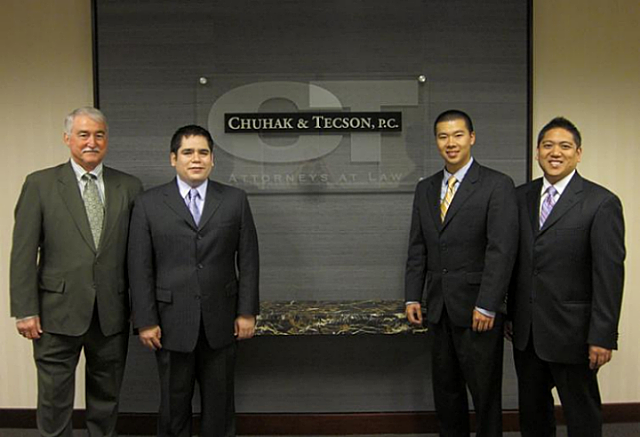 “Working with Chuhak enabled us to see how heavily clients interact with outside counsel on legal matters,” Ortiz said. Feng agreed that working with both MRC and Chuhak gave him a new understanding of his chosen profession.